Australians now spend as much as $1 billion annual on appearance medicine. In a bid to compete with cheaper cosmetic tourism, Assure has released all-inclusive breast augmentation packages for $8,990, a treatment traditionally priced from $10,000 to $15,000. “We believe that lower pricing for breast implants with a local specialist plastic surgeon will see more and more women avoid the potential risks of choosing the wrong type of doctor,” Assure Cosmetic Centre specialist plastic surgeon Dr Vij Vijayasekaran says. 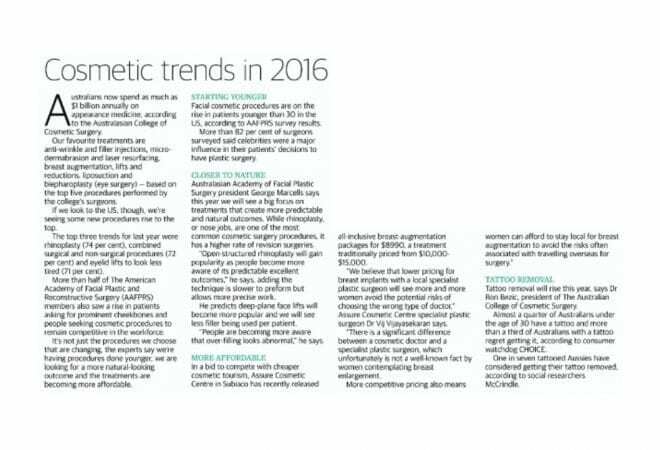 Read more about Assure’s special Perth breast implant pricing package and other emerging cosmetic trends.